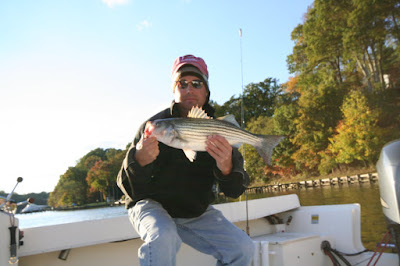 On Oct. 18th I was working the shoreline behind the old island and picked up a real nice 20 incher next to the dock with crab cage. This new Lake Riva spot will now be referred to as the "Crab Cage". 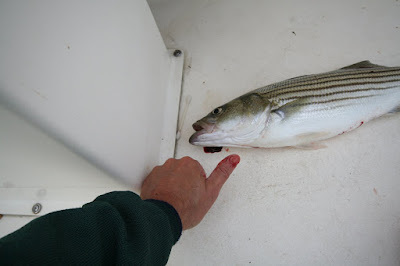 Unfortunately, as I went to show the fish to the old timer on the pier, she shook and sunk the front treble hook deep into my thumb. WHEN WILL I LEARN? 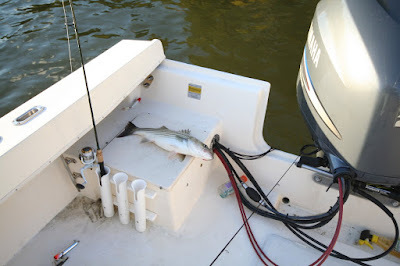 After waiting 10 minutes for fish to settle down, I began the 15 minute, very painful,process of rocking the hook free. My luck went downhill after that. We had the annual Harbor Hills tourney on Sat. After a massive storm on Friday night, it was windy Sat., with too many leaves on water to work a plug. Only managed one 16 incher on a curly tail. Winds and rain continued for the entire next week. Was not even able to fish the 24-26th which should have been "prime time". Oh well. I was well rewarded for my patience tonight when I picked up what appeared to be the biggest fish from the river this year. Picked her up at "Al's Spot" around 5 pm. Several nice jumps. Season starting late, buy should be good. Water temp is still 68 degrees versus 56 last year.